Eat your heart out Prius. The new energy-efficient kid on the block looks a little sexier. While a lot of automakers are talking about bailouts and bankruptcy, at least one company is moving full steam ahead with expansion. Tesla Motors Inc. has announced plans to open a Midwest regional sales and service center in Chicago this spring, the first of seven similar retail facilities scheduled to launch this year. The store will be located at 1053 W. Grand Ave. near the Kennedy Expressway. The California-based company designs and manufactures electric sports cars with an emphasis on speed and energy efficiency. 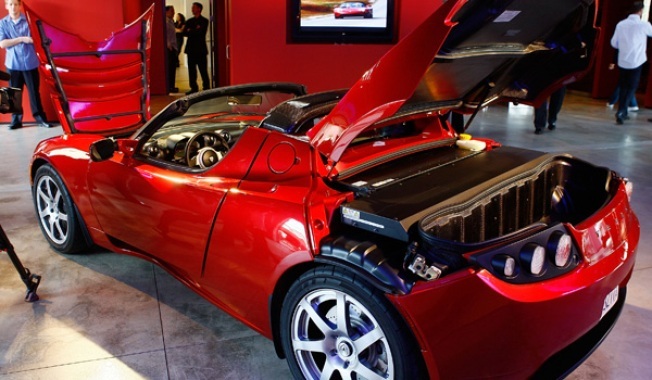 The company claims that the Tesla Roadster beats nearly every other car for acceleration yet is twice as energy efficient as a Toyota Prius. It gets an EPA-estimated range of 244 miles per charge, costs around $4 to refuel, and can be completely recharged in 3.5 hours. A new prototype sedan, the Model S, will be unveiled on March 26. The Model S is touted as an all-electric, zero-emission four-door with an anticipated base price of $57,400. But with tax credits and inexpensive maintenance and fueling costs, officials say the lifetime ownership cost will be lower than luxury cars with similar sticker prices. "The Chicago store will introduce the company to even more people in the United States and position us to launch a more affordable sedan for mainstream drivers," said Tesla CEO, Chairman and Product Architect Elon Musk. The company opened it's first two showrooms in California last summer, and plans to open future locations in London, Manhattan, Miami, Seattle, Washington, D.C. and Munich, Germany.